Hello, friends! Crystal here with my official last post as part of the Butterfly Reflections design team member. So I figured it ever ironic to make a card saying Hello since it's never really a "goodbye" but a "see you later". 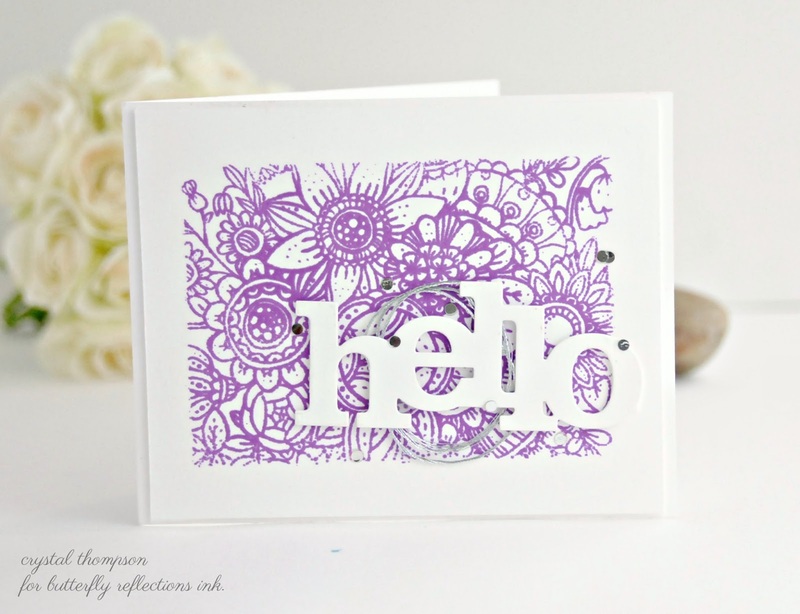 To make this card, I began by masking each side of my card panel, then stamping the floral background using Honey Bee Stamps Zen Bouquet in Altenew Deep Iris Crisp Ink. Next, attached silver thread to the "hello" from Winnie & Walter. This was attached to the card base using foam adhesive and topped off with Pretty Pink Posh silver confetti. I really like how the sentiment does not takeaway from the beautiful background stamp. I hope my tenure here has been a source of inspiration. I absolutely loved being part of this great team and working alongside Vanessa. Thanks again for a fantastic term, Cheers!